Today’s scriptures taken from first Thessalonians five, one to eleven. Now concerning the times and the seasons. Brothers and sisters, you do not need to have anything written to you. For you yourselves know very well that the day of the Lord will come like a thief in the night, and they say there is peace and security. Then sudden destruction will come upon them as labor pains come upon a pregnant woman and there will be no escape, but you beloved are not in darkness for that day to surprise you like a thief for all your children of light and children of the day. We are not of the night or of darkness, so then let us not fall asleep as others do, but let us keep awake and be sober for those who sleep, sleep at night, and those were drunk, get drunk at night, but since we belonged to the day that is to be sober and put on the breastplate of faith and love, and for a helmet, the hope of salvation for God has destined us not for wrath, but for obtaining salvation through our Lord Jesus Christ who died for us so that whether we are awake or asleep, we may live with him. Therefore encourage one another and build up each other as indeed you are doing. This is the word of the Lord. The early Christians thought that Jesus was coming very soon. Of course, as you know, Jesus did not come as soon as they expected, they kind of lived with some mistaken expectation about the coming of Jesus, but there was one thing that all the early Christians had, they were alert and they lived with a sense of urgency. In the early Christian community. This sense of urgency was very important. Therefore, they all emphasized the importance of living with a sense of urgency. So even in their documentation, they made sure that the story about that will be there. So for example, a Jesus’ parable about 10 bridesmaids; Jesus came, and five bridesmaids prepare the oil, but the other five did not prepare the oil. In other words, the five were awake and alert, and they lived with a sense of urgency, but the other five did not do that. A lot of stories are in the Bible to show that living with a sense of urgency is very important. In that urgency, I believe that they were able to produce the masterpiece called the Bible. The Bible did not just come into existence in a normal mindset, in that very urgent mindset. They were able to produce the masterpiece called the New Testament. Living with a sense of urgency does that, it puts you in a totally different mindset. The person who lives with urgency, and the person who lives mindlessly, the quality of their mindset, the quality of their thinking are totally different. When you live with a sense of urgency, you can be creative, alert, purposeful, passionate and alive. That’s what he does. People come alive when they have the sense of urgency, the modern society; I don’t know why the model society takes away this sense of urgency in people. I feel like we’re all crazy, like we hear so many people get killed in Las Vegas and then all of a sudden we get this urgency. Wow. And the next day as though nothing happened and that’s something that we look at, and then we walk away. Even when I look at myself, this is crazy. When two people are threatening each other with nuclear threats. Oh, I just hope that nothing bad happens and we just move on. There’s no sense of urgency at all in modern life. I don’t know why. Maybe our life is too structured and programed, so we feel we have security and stability? Is that why? Whatever the reason may be losing this sense of urgency is killing our soul! it’s killing us. Is it because the world has become so big that we feel drowned in it? I can’t do nothing about it, but I see some exceptional people who live with a sense of urgency. Even around us. The other day I read an article in the Rolling Stone magazine about Elon Musk. It was a very interesting article. It was a interview, and Elon’s brother Kimbal, said about Elon in this way. He’s able to see things more clearly in a way that no one else I know of can understand. His brother saw his brother, and he had this keen sense of seeing things that no other people can see. And Elon Musk said, climate change is the biggest threat that humanity faces this century except for artificial intelligence. Elon Musk makes rockets, he created an electric car, and he is looking for planets for human beings to be able to inhabit- and I don’t know, sounds like crazy. But somehow he’s not comfortable with the way he just lives. He has this sense of urgency. We gotta do something about it. We cannot just move on. I mean, he has so much money, has so much power. He can live his life without worrying about anything, without sense of urgency. He can eat a steak every night if he wants. still has lots of money left. I mean, he could comfortably go on vacation all he wants if he just lives for himself. He didn’t need to feel any sense of urgency. He could just live normal, but he lived with his sense of urgency to leave a better universe, better nature, better earth to the next generation. Is it because he’s so smart and so powerful and so big? That, he could make some changes in the world. He can dare to think about making a dent in the universe or he is there make some changes in the war because he’s so smart and so powerful? Maybe. It may be easier for him to have the sense of urgency because he’s so powerful, that he can do something about it, something about his life and something about the world he lives in, but I don’t think only smart and powerful people can live with a sense of urgency. I think a sense of urgency comes from a clear understanding of one’s purpose. When you have clear understanding of your purpose, then you have sense of urgency. When you don’t have any purpose, then nothing’s urgent. Just life moves on, you can just live comfortably, but when you have something that you want to achieve while you are alive, then you get this sense of urgency. We won’t be just satisfied with just making a living. When we have a purpose, peace and security will not be everything we want in life. My friends, that’s a lie, that is a lie, peace and security is everything about life? that is a defeated mentality. That’s people who lost their soul, they think like that. Peace and security is not everything about life. That was what Saint Paul said in today’s scripture when they say there is peace and security, then sudden destruction will come upon them as labor pains come up on a pregnant woman, and there’ll be no escape. In Paul’s time. Many people live with sense of security and peace; like Roman peace, Pax Romana. Well, everything is good and fine. Everything is peaceful, and you are secure. Paul was surrounded by that kind of mentality, but he saw something else. No, there’s an urgency here, so peace and security versus urgency. Paul chose urgency and I agree with Paul. Paul is saying live with a sense of urgency, a sense of urgency is more important than living with a false sense of peace and security, living with a false sense of peace and security. We can create nothing. We can do nothing. 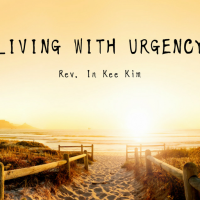 When we live with a sense of urgency, we enter into a different realm of life. It is different consciousness, different realm of existence. When we have that sense of urgency, we enter into that. When artists produce a masterpiece, they are in a different level of consciousness, a different realm of existence. Your power and energy will come from within us. Everything comes alive within us. Every cell of our bodies, awakened with new vitality. We don’t live falling asleep, we are urgent. I wonder where this sense of urgency comes from, mistaken expectation? “Oh, Jesus will come soon.” Is that how they got the sense of urgency? Maybe partly. So I was reflecting on it. Where did these early Christians get that urgency? I reflected on it and read the Scripture and I found this scripture that is from acts, it is what luke said, but he was actually the quotation from the Joel prophet. He says “in the last days it will be, God declares that I’ll pour out my spirit upon all flesh, and your sons and your daughters shall prophesy and your young men shall see visions, and your old men shall dream dreams. When the spirit came upon them, something happened within them. All of a sudden they all became awakened and they got this sense of urgency, and in that state of mind they were able to prophesy. Young people could see visions and old people could dream dreams, something totally no one ever expected happened within them. They were able to see visions. They were able to dream dreams. Certainly Martin Luther King Jr., When everybody automatically assumed racial discrimination is reality of life that you must live by, he said no, and he with a sense of urgency, he wanted to change that. I think it’s the movement of the spirit, it is I believe, the prompting of the spirit, that prompts you to live a better life. They all entered into a different realm of life, different dimension. Their life became a life of vision, dream, and purpose. All the great people in the history saw the vision, had the dream and lived out the purpose they found. That was how they impacted the world. Living a lethargic life is not an only option. Don’t believe in that lie, just because you have a house secured, job secured. That’s not the only option to live. That can never be your goal. We have to see bigger things in life. You have to find life. We are made. We are made not to be happy when you live only for yourself. That’s how we are created to be. We can never be happy when we live for ourselves. Is it nature? We can only be happy when we live for other people and for God, who takes care of- who cares for the world, only then we can be happy. That is a noble purpose. Time we have, it’s not gonna be there all the time. When we realized that time is limited, we cannot just waste our time. St. Paul said this; “Now concerning the times and the seasons, brothers and sisters, you do not need to have anything written to you. You already know it, for you yourself know very well that the day of the lord will come like a thief in the night.”. The other day I watched the news and this guy was making a bomb shelter, he built everything so that he could be saved from the nuclear war, and be able to securely live for many years. Being awake means this present moment is awake. There may not be tomorrow, tomorrow is tomorrow, but today, we have to be awake. You can do so much. You can do so much. You know, it saddens me when I see talented people waste their lives with defeated mentality. It saddens me. It makes me angry when they could do much better. The other day I talked with a guy. He called me, he lives in San Francisco “Reverend, I want to give a donation or a gift scholarship in my father’s name.” He said “I’ll give $100,000 initially and every year $12,000. I want to support theological students with that money.” So I said “that’s great. I’ll help you use your money.” And the other day a woman came to me, “I’ll give a $30,000 to help out the poor and needy during this Christmas season.” at least there is some movement. As we come to God, God will awaken us as we humbly pray, the spirit will awaken us, then we can enter into a different realm of existence, not just victims of materialism. Your horizon will be open, your eyes will be open, you can see the vision and you will dream dreams. I think that is what life is all about. I believe that was the power that broke through the darkness in the early christian history. I mean, it is just a miracle for me how Christianity survived that kind of persecution in the first 20, 30 or 50 years. I mean, it’s a small set. 12 people started, hundred people gathered together and prayed, and how could they break through that roman power and all that way of roman thinking, and become Christian. Christianity? That itself is a miracle. I believe that it is a power of those who are urgent, who felt urgency, I think it is the power of those who are totally awake. They had a different sense of living. We have to be alive. We have to awake. We have to come alive. Are there artists who can create masterpieces? Are they engineers? Are they a poet? You can come up with a tremendous piece once your whole week. You’re very talented people, but talent itself is not good enough. Your brain is not good enough. You need power for your talents to become actualized like god. Anoint you. Let god take you to a higher level. Let us come out of our shelter and enjoy the freedom to be the best you can be for others sake, for God, and for the world.